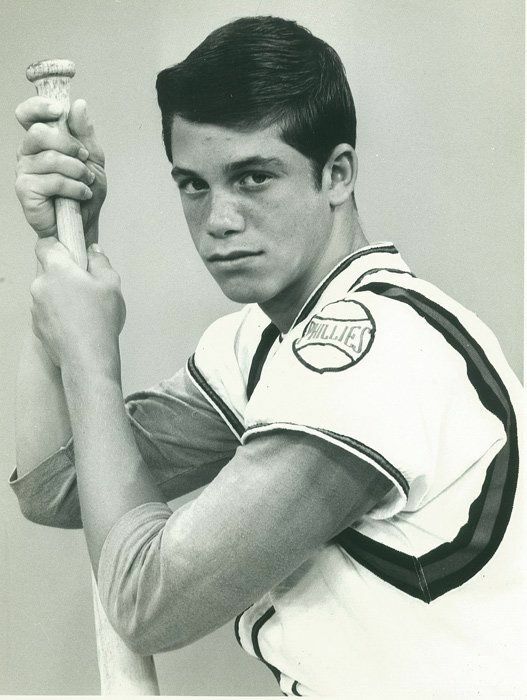 Before Randy Poffo changed the wrestling world as “Macho Man” Randy Savage, he was a talented baseball player with big-league aspirations. Here is his story. Angelo Poffo was the type of dad who would do anything he could to support one of his children when they expressed a new interest in something. When Lanny voiced an interest in the violin, Angelo immediately bought his youngest son an imitation Stradivarius. Later, when Lanny mentioned photography, Angelo purchased a high-end Nikon camera with multiple lenses and other accessories while setting him up with a dark room. Angelo even went as far as asking fellow wrestler and tag team partner Killer Kowalski for suggestions on what equipment to buy. Lanny and big brother Randy Poffo (Savage) also shared an interest in baseball. Angelo again put full support behind his boys by having a winterized batting cage with a pitching machine built in their yard, so the brothers could keep their skills sharp while escaping the nasty Midwest winters that annually hit this suburb 20 miles west of Chicago. 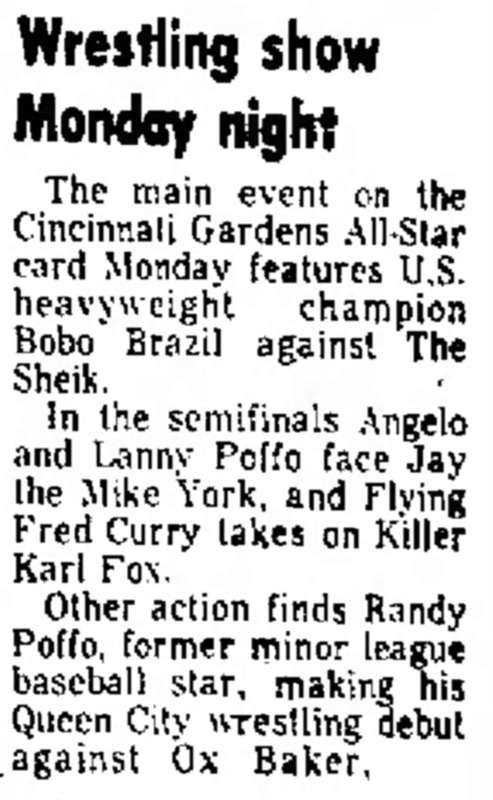 Angelo also fed their love of the game by frequently bringing the Poffo brothers to either Comiskey Park or Wrigley Field to watch baseball’s stars when they came to play in Chicago. Athletics were prominent in the Poffo home. Angelo enjoyed a successful 42-year wrestling career, earned a degree in Physical Education at DePaul University and is renowned for setting a Naval and world record in 1945 by doing 6,033 consecutive sit-ups, which was recognized by Ripley’s Believe it or Not. Both Poffo boys also possessed his athletic DNA. Lanny and Randy Poffo played sports throughout their childhoods – basketball, football, baseball and wrestling – but baseball truly captured Randy’s heart, oftentimes walking with Lanny to a nearby neighborhood field to play ball. A devout Cubs fan, Randy’s favorite players were Cincinnati’s Pete Rose (a.k.a. Charlie hustle) and Johnny Bench (an all-time great catcher). When Randy was 10, Randy’s mom, Judy Poffo, signed him up for Downers Grove Little League. From the first day, he was a catcher. Randy Poffo must’ve caught the bug from his dad, as Angelo was a catcher for the DePaul University baseball team. Like Randy, Angelo had dreams of a baseball career but in 1947, he was knocked unconscious by a high, inside pitch, and try as he might, couldn’t overcome being “plate-shy.” Prior to the incident, Angelo received pro offers and had signed to report to a North Carolina state league team the next spring but instead turned to his second love – wrestling. Angelo mentored Randy about the skills and strategies that go along with playing catcher such as how to call a game, how to block the plate, how to see the field and how to emulate players like Bench and Randy Hundley. In 1968, the Poffo family moved to Hawaii for nearly a year following Randy’s sophomore year at Downers Grove High, after Angelo was offered a lucrative opportunity to wrestle for promoter Ed Francis in the Hawaii territory, as well as in Japan. Angelo saw the temporary uprooting as a chance for his boys to focus solely on baseball while being homeschooled. Lanny said, Angelo figured by holding his sons back a year while he wrestled in Hawaii, they would have less of a chance of getting drafted for the Vietnam War, and Randy would have a competitive advantage once his high school baseball career resumed. 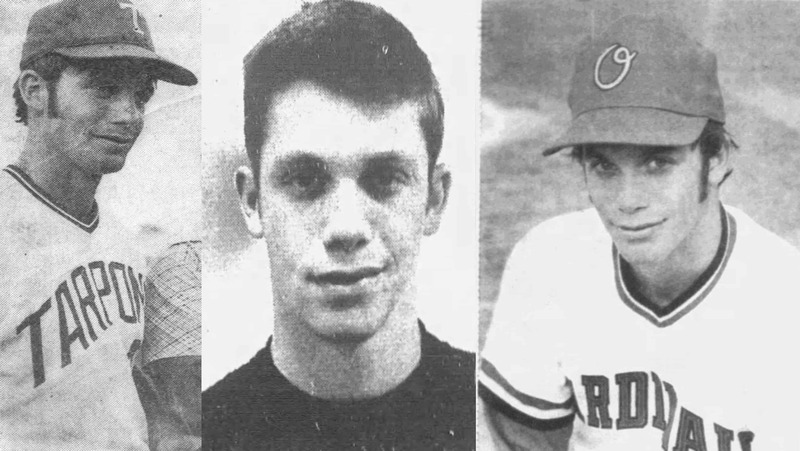 During the time away, Lanny and Randy Poffo played baseball nonstop. There were never-ending games of catch, followed by more never-ending games of catch. When Randy returned to Downers Grove High School, he was one of the oldest students in his grade, if not the oldest. He was also a much more polished baseball player and the results showed on the field as well as in the boxscore. 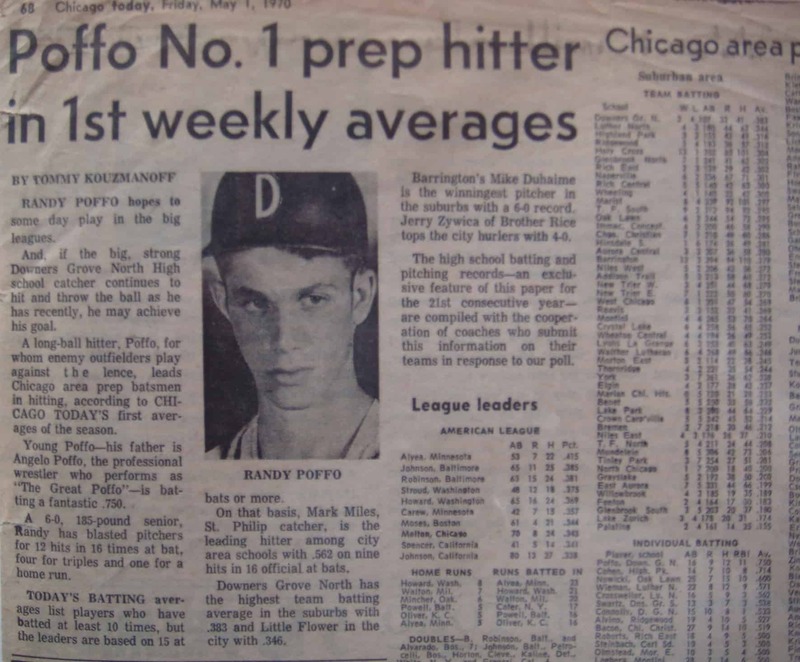 During his junior season, Randy Poffo was named his team’s Most Valuable Player after posting a .500 batting average, tops among all Chicago high school hitters, with three home runs, four triples and eight doubles. The switch-hitting catcher was also named to the All-State Team. 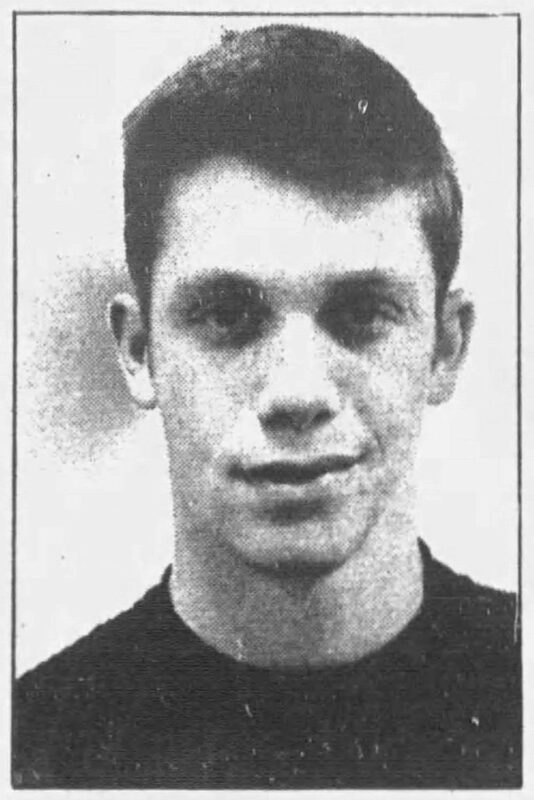 His senior season was even better as Randy Poffo batted a state record .525 when his team was the Western Suburban Conference co-champion. Randy again was named team MVP and selected to the All-State Team. 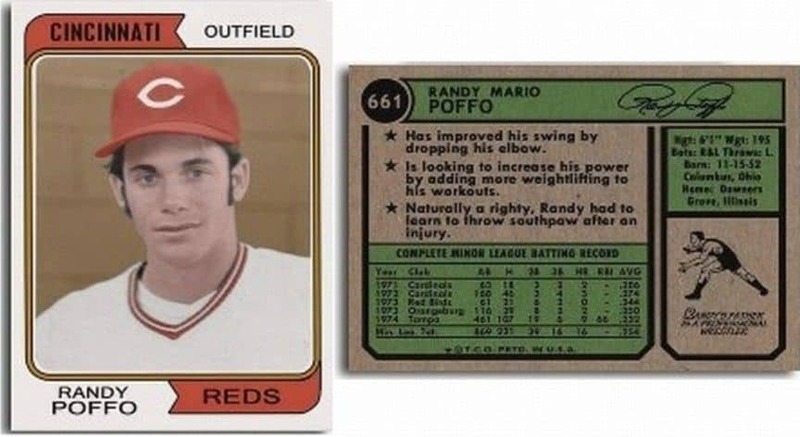 In addition to excellence on the diamond, Randy also played football as an outside linebacker, and basketball, and was a National Honor Society member. However, it was his excellence in baseball that made his dream of becoming a Major League Baseball player seem possible. The stands were dotted with major league scouts who attended games watch Randy Poffo play during his senior season to gauge his value as a prospect for the upcoming 1971 MLB Draft. Guarnaccia recalled a day scouts came to see Savage play and he was sick with a 102-degree fever. After struggling that game, scouts came around less often. “I heard one scout say he over-hustled too much, which is BS,” Guarnaccia said. Randy wasn’t selected in the 1971 MLB Draft and Lanny said his brother turned down a scholarship offer from Arizona State, one of the top collegiate baseball programs in the country. “That was the darkest of dark times for us,” Lanny told Sports Illustrated. “To describe it simply as sad does the pain no justice. Randy was ignored. Completely ignored. I assure you, he never forgot that feeling. In 1970, Randy also played with the Chicago Orioles, a top amateur team comprised of local high school and college all stars. He was set to play with them again after his senior season until his pro aspirations were revived. 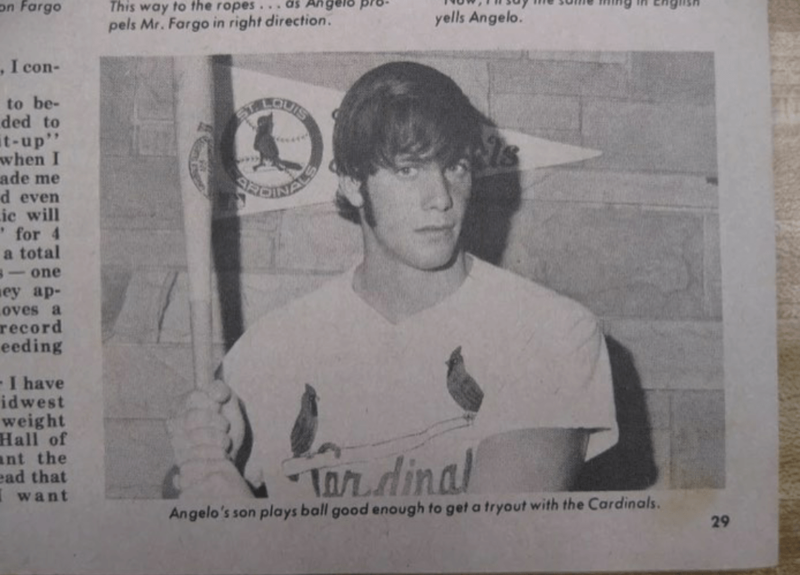 The St. Louis Cardinals hosted a free-agent tryout at Busch Stadium, so Randy shook off the devastation of not being drafted and, with his dad, drove 300 miles to participate. Out of the more than 200 players who attended, Randy was the only one who received a contract offer. Randy signed with St. Louis on the same day as future five-time MLB All-Star first baseman Keith Hernandez. 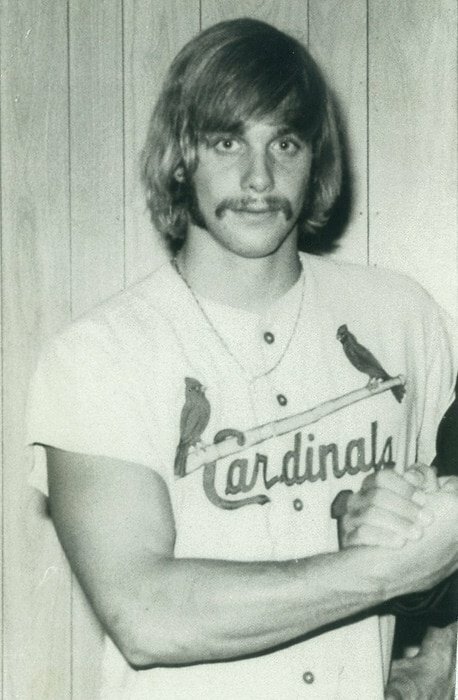 A young Randy Poffo signed to the St. Louis Cardinals organization after a free-agent open tryout. He was the only one who received a contract offer out of more than 200 who attended. 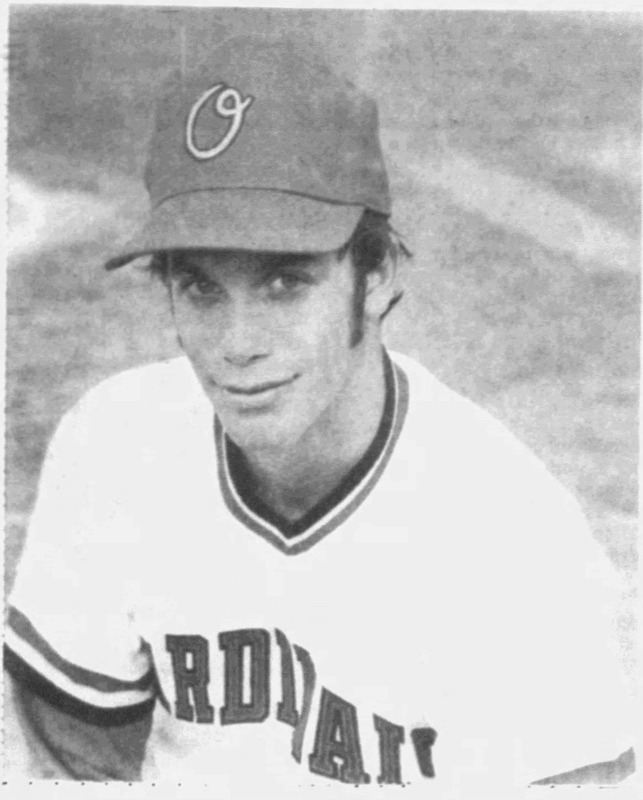 Randy Poffo began his professional career in the Fall of 1971 with the Cardinals’ Gulf Coast League team – the Sarasota Red Birds. There, he suited up with future major league outfielders Jerry Mumphrey, Mike Vail and Larry Herndon. Motivated by the chip on his shoulder after going undrafted, Randy quickly established a reputation for his work ethic, usually staying late after workouts and games to run the outfield and practice throwing from behind home plate down to second. 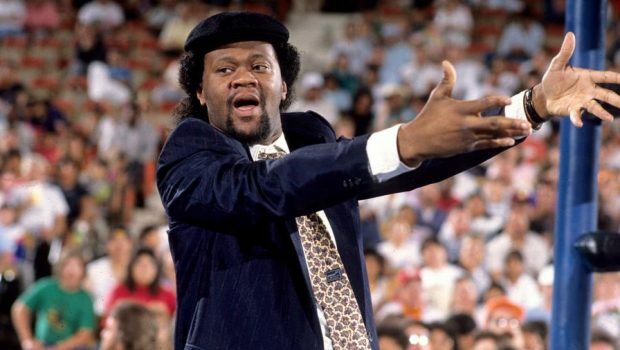 Herndon said Randy Poffo was well-liked by teammates and described him as a diligent worker. “He kept everybody [on the team] loose,” Herndon told ESPN. “He was always having fun.” Herndon said Poffo used to swing a bat into a car tire fixed to a tree as a regular training exercise in order to strengthen his hands and make sure he utilized his legs during swings. The technique was so effective that Herndon adopted it from Poffo when he became a manager. The hard work paid off as Randy Poffo was named an all star as a catcher after batting .286 (tops among all regulars) with a team-high two home runs (the ballparks were huge), a .492 slugging percentage and no errors in 15 games behind the plate. Randy excelled during his second professional season, again in Sarasota, batting .274 in 52 games with a team-high three home runs and another selection to the All Star Team, this time as a switch-hitting outfielder. Garofalo lived with Randy and two other players in a place on the beach in Sarasota. He didn’t know anything about Randy’s childhood or what his family did for a living. Baseball teammates who lived with Randy Poffo had no idea that his brother Lanny and father Angelo were involved in wrestling. It wasn’t until Randy’s family visited him when his teammates found out. While teammates like Mumphrey and Vail made comfortable salaries thanks to the contracts they signed as highly touted prospects, Randy fought to survive on $500 a month. While he lacked the same financial comfort, he used his Honor Society smarts in a way to be resourceful to compensate for his low compensation. Randy began 1973 with Sarasota for a third season. He struggled early on but then, just when it appeared he might lose his roster spot, his bat came alive and Randy raised his batting average to .344 through 25 games. His surge at the plate caught the attention of the Cardinals organization and they promoted him to Class A Orangeburg of the Western Carolinas League. There, he played for manager Jimmy Piersall, an eccentric former major leaguer who famously ran the bases backward after hitting his 100th career home run. The club was an independent team but featured several players from the Cardinals organization. Randy was assigned to room with a young outfielder named Tito Landrum, who would play nine major league seasons. It was during this season when the first inkling about Randy’s intention to eventually follow in the family business and become a professional wrestler was evident. 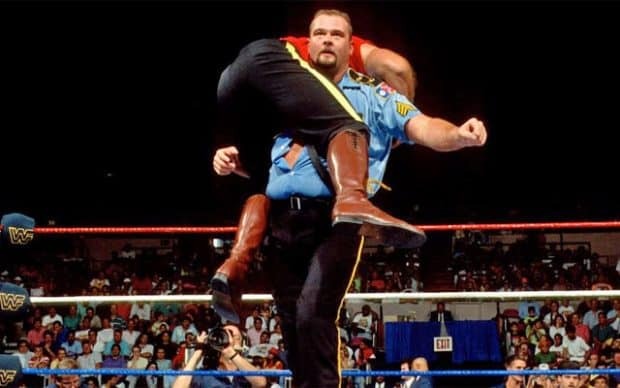 “Randy Poffo was a very aggressive player and was well-liked on the team because of that aggressiveness,” Landrum told The Baltimore Sun in a June 1994 interview. “Unfortunately, much like the rest of us, he had a problem hitting the curve. While the promotion seemed like a dream for Randy, that season turned out to be a nightmare. Mirmow Field, the home ballpark in Orangeburg, South Carolina was a dump. The weather was often extremely humid, the ballpark was huge, the playing surface was typically in terrible condition and the stands were mostly empty. Randy was highly regarded but slumped and batted .250 in 116 games and showed very little that he was a legitimate major league prospect. In Sarasota, Randy was a starter but in Orangeburg he found himself either on the bench or spelling others at catcher or first. A highlight came late in the season when Guarnaccia, a fourth-round draft pick of the Phillies now playing for Spartanburg, stepped up to the plate while Randy was catching. The two smiled at each other — childhood friends from suburban Chicago, reunited in a gnat-infested minor league stadium. The nightmare continued as Randy’s season concluded shortly thereafter when he separated his right shoulder and tore the muscles after colliding with the catcher at full force on a close play at home plate. At season’s end, the Cardinals released him. 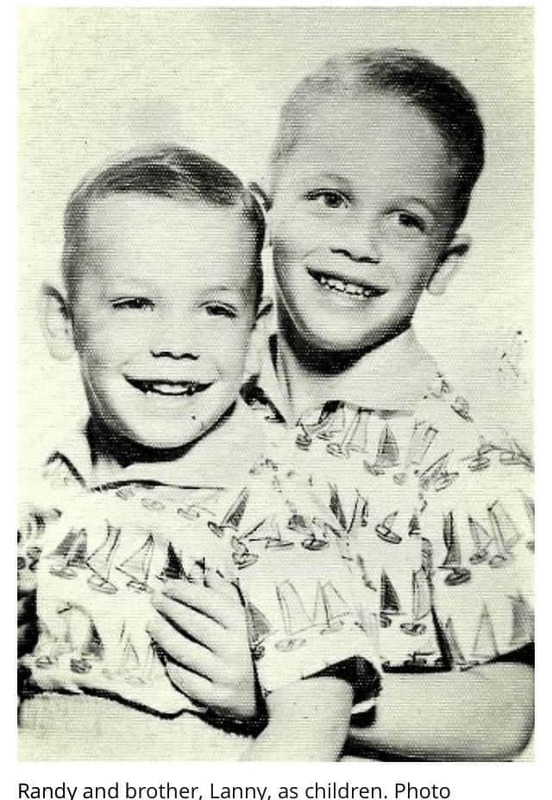 Randy and his dad Angelo featured in the Monday, June 3, 1994 edition of The Tampa Tribune. Randy attended a Cincinnati Reds tryout camp at Lowry Park in Tampa and area scout supervisor George Zuraw of Englewood invited him to spring training prior to the 1974 season. He came to Tampa without a contract when the Florida State League decided to employ the designated hitter rule. That was the break Randy needed as manager Russ Nixon said he could use his bat. There was one last chance. 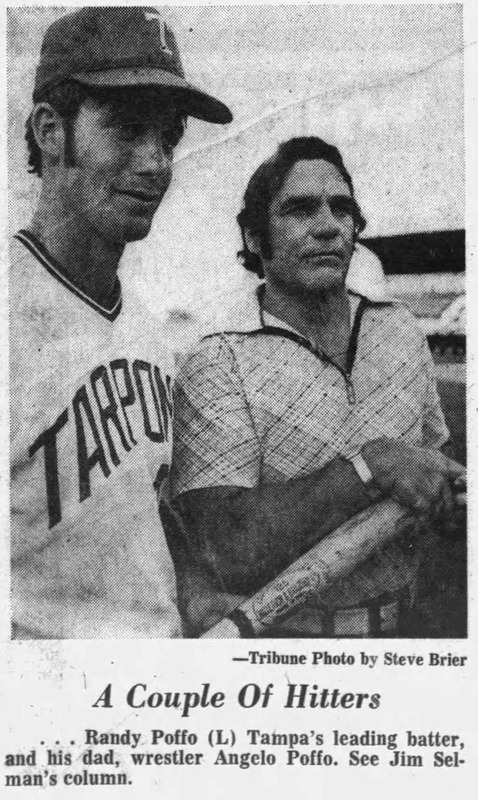 With a vacant spot on their Class A Florida State League club, the Cincinnati Reds signed Randy Poffo and assigned him to the Tampa Tarpons. 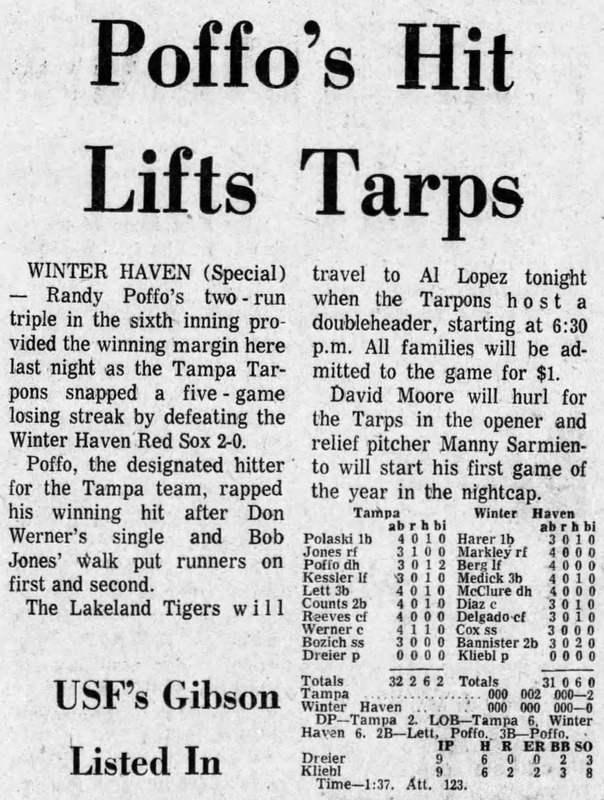 A headline about Randy Poffo while with the Tampa Tarpons featured in the Tampa Bay Times, Monday, June 24, 1974. Randy delivered at the plate. Although he only batted .232 in 131 games, he finished third in the Florida State League with nine home runs, just behind Hall of Famer Eddie Murray and major leaguer Gary Roenicke, with a team-high 66 RBI. Throwing with his off hand was something Randy first started in high school when he practiced pitching with his left hand, again in an effort to increase his value. He resumed the practice while rehabbing his shoulder injury, throwing 1,500 balls against a wall per day. This season also saw Randy earn a nickname that would stick with him for the rest of his life. 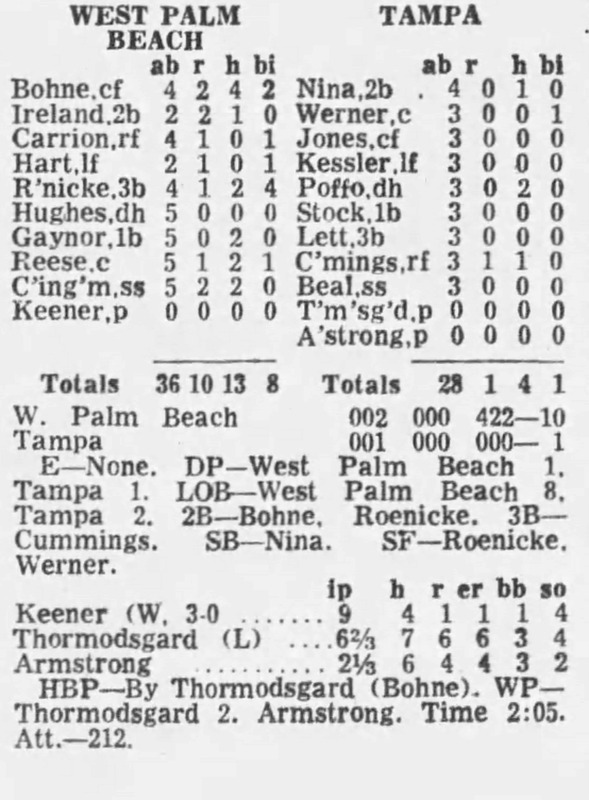 On April 29, 1974, midway through a game against the Winter Haven Red Sox, Randy was preparing to bat when Rac Slider, the opposing manager, signaled for a pitching change. Randy was kneeling in the on-deck circle waiting for the inning to begin when he was beaned by a warmup pitch from the opposing pitcher, Joe Keener, setting off a monstrous brawl. “I guess he thought I was looking at his pitches, and the next thing I knew he had hit me in the face,” Randy said. “I just ran out there by instinct and attacked him, worked him over real good. 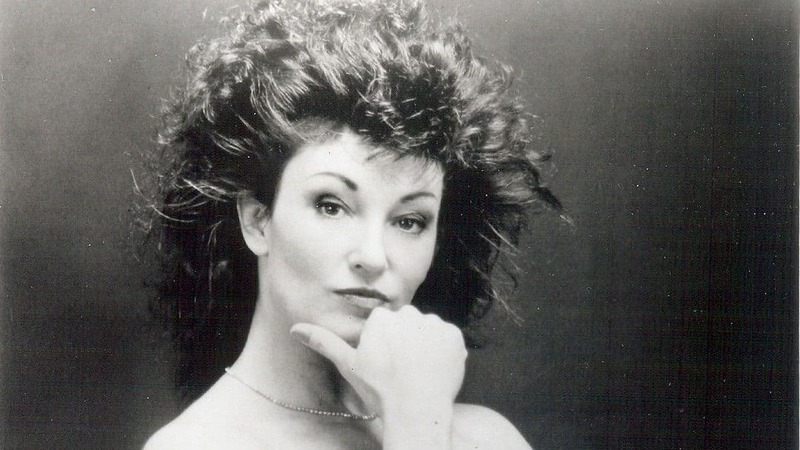 “Next day in the paper, some writer gets on me, says I was acting like some macho man. I liked that and it became part of my name. A version of the incident from the Apr. 30, 1974 edition of The Tampa Tribune by Assistant Sports Editor Jim Selman differed about the brawl itself but not the fact that Randy was intentionally thrown at. While Randy was clinging to the final hopes of achieving his major league dreams, reality was setting in and the pull toward a career in professional wrestling grew stronger. Randy said he and his Tampa teammates would go and watch wrestling after Friday night games. While Angelo encouraged his sons to not follow in his footsteps and deal with the constant travel and frequent injury that goes along with being a wrestler, Randy eventually realized he wanted to wrestle AND play baseball. 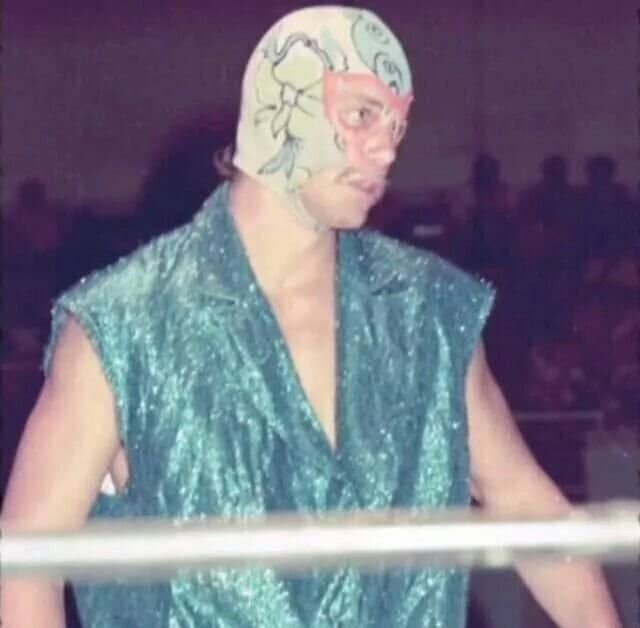 Randy began living a secret second life by moonlighting as the masked wrestler ‘The Spider,’ making shots at shows around Florida during the offseason. Randy had to keep his identity a secret, as wrestling was in violation of his baseball contract. Realizing he was near the end of his baseball career, Randy wanted to take one more shot at achieving his dream before he could commit to a career in wrestling with the peace of mind that he exhausted every opportunity to play baseball. In 1975, Randy signed with the Chicago White Sox and tried to earn a roster spot with one of their minor league teams as a left-handed first baseman. Poffo attracted much attention during spring training with his ambidextrousness and surprised White Sox Manager Chuck Tanner but he hadn’t mastered the vital sidearm throw from first to second on double plays. He failed to make the final cut for a place in the Chicago minor league system with the Appleton club in the Midwest League or their AA team in Knoxville. Upon his release, Randy’s undeniable spirit was on full display as he picked up his equipment, walked through the clubhouse door and as teammates looked on, systematically splintered each of his bats against a nearby tree. The baseball dream had come to an end but as one door closed, another one opened. It was then when 24-year old Randy Poffo followed his dad Angelo, and 22-year-old brother Lanny into the family business – and became the first pro baseball player to become a wrestler. “Randy Poffo was a real nice guy,” former Cardinals player development director Lee Thomas said, but then the manager of another rookie league team. “He seemed like such a quiet guy at the time. “He was a good athlete, but you could tell he wasn’t going to go too far in baseball. He was a mediocre catcher, but every now and then he’d show you a little bit with the bat. Poffo called promoter Francis Flessner in Detroit when the White Sox released him, and Flessner agreed to give him a chance. 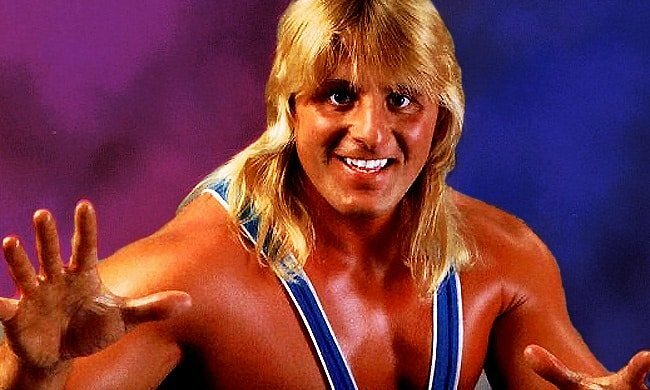 He defeated Joe Banic in his official wrestling debut as Randy Poffo and wrestled there for six months. “I love baseball but I kept hearing about my brother and dad doing so great. I just wanted to get into it,” Randy said in a Nov. 1975 interview with The Tampa Tribune. “You never get as much satisfaction out of baseball as you do wrestling. You take all your frustrations out in wrestling. In baseball, some skinny guy on the mound may get you out, or maybe you hit a couple of line drives that are caught and you go home 0-for-4. 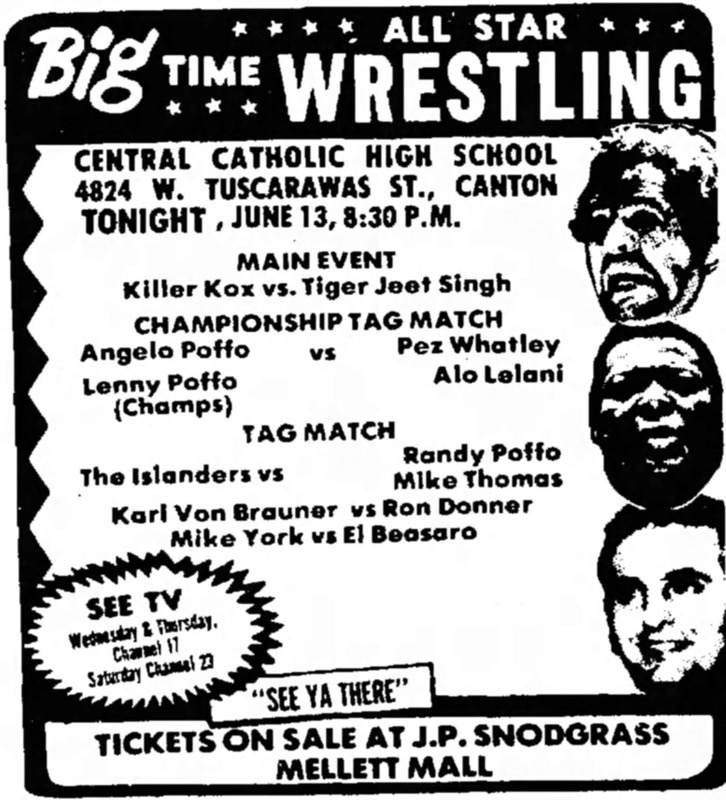 Wrestling advert featuring the Poffo family from the Friday, June 13, 1975 edition of The Evening Independent. Randy wrestled with his brother in the family-owned promotion IWA and Memphis territory while working out with the same fervor he showed on the baseball field and bulked up to 225 pounds. Fans took to his intensity and athleticism and Randy became a main eventer.. In 1985, Randy Poffo made his WWF debut and the Macho Man went from a big fish in smaller ponds to a budding star with the largest wrestling company in the world. In minor league baseball, Randy was typically a middle-of-the-lineup hitter but the most he ever earned was $800 a month. 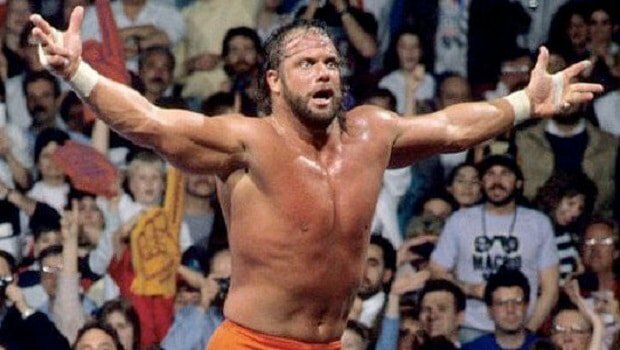 During the first year of what would become a Hall of Fame career with the WWF, he earned almost $500,000. The Reds went on to lose their 10th consecutive game. While Savage hoped to leave his mark in baseball with his play on the field, there is no doubt his backup plan of becoming a professional wrestler and the 32-year career that followed earned him a place as a renowned pop culture icon that was beloved by millions around the world. While Savage made his name in the ring, his time on the diamond is remembered back home. 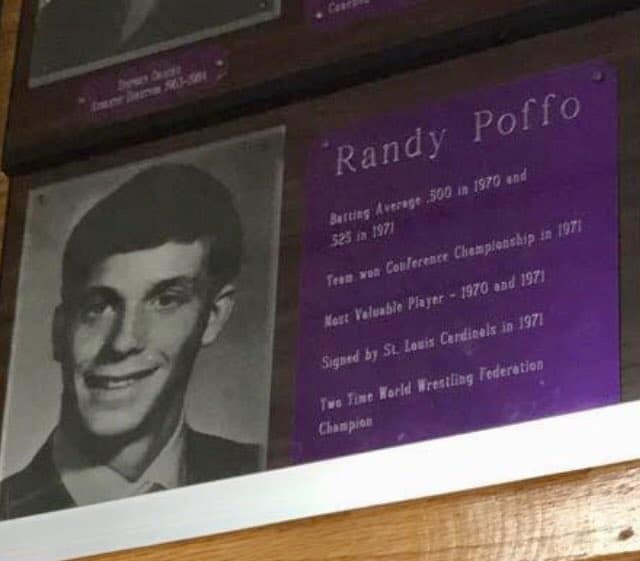 A plaque honoring Randy Poffo hangs with more than 60 others in a hallway of North Downers Grove High School, near the gym door closest to the athletic department’s office, second row down from the ceiling. Ron Matejko is an award-winning writer and filmmaker for Turnbuckle Magazine (Twitter and Facebook), curator of Old Wrestling Pics, and has covered MLB and NHL for ESPN.com.